January 18, 2019 Chanunya Srihawan, M.D. PM2.5 air pollutants can be inhaled deep into the respiratory system and lungs. The effects of this include irritation, a stinging nose, the buildup of phlegm, coughing, sneezing, asthma attacks, cardiac arrest, ischemic strokes and, most dangerous of all, lung cancer. Outdoor exercise should be avoided during periods of smog and high air pollution, as strenuous activity or heavy breathing may lead to increased levels of PM2.5 pollutants being ingested into the respiratory system and lungs. N95-protective masks must be worn correctly, ensuring that it fits tightly on the face. Also, previously worn masks should be thrown away instead of being used again. The World Health Organization (WHO) has set an average rate for PM2.5 air pollutants, stating that if there are over 25 micrograms per cubic meter, it is seen as being dangerous to health. At the same time, Thailand has put the levels at which a danger is posed to health by PM2.5 air pollutants at 50 micrograms per cubic meter. However, whichever standards are referred to, the current PM2.5 air pollutant levels present in the Greater Bangkok area are at a critical level, with almost 100 micrograms per cubic meter being measured on a daily basis. These levels are especially high next to or on roads with heavy traffic, as well as within close proximity to building sites. It is an inescapable fact that large cities like Bangkok and other big capital cities around the world must face up to the issue of air pollution on a daily basis. This is a consequence of such large numbers of people, limited traffic space and dust which is produced by constant construction. 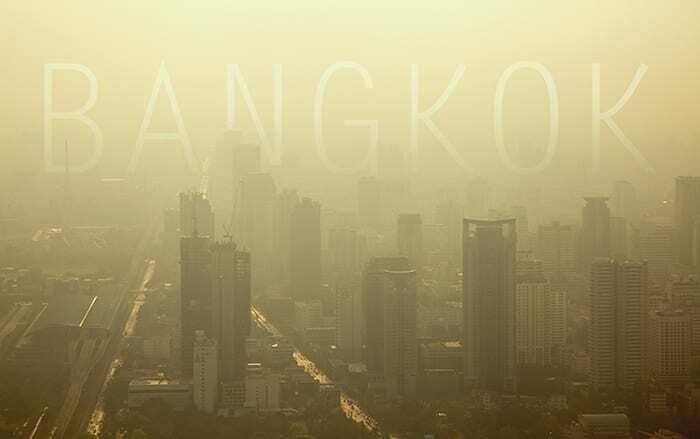 Nevertheless, the current crisis affecting Bangkok residents is as a result of particulate matter smaller than 2.5 microns in size (PM2.5), meaning that it cannot be seen with the naked eye. Thus, people have been slow to realize the massive health risks posed by PM2.5. The tiny PM2.5 pollutants generally come about due to the burning of fuel by motorized vehicles – especially cars – no matter their age. The highest concentration of PM2.5 occurs during the morning and evening rush hours, while the critical levels currently observed tend to occur during the cool season. This is because there is a lack of wind and rain at these times, meaning the dust hangs around at ground level. Moreover, wind finds it difficult to pass through modern-day Bangkok because of the tall buildings blocking its path, while dust from the numerous construction sites throughout the city is another factor behind the decrease in air quality. What’s more, environmentalists have provided additional information on the PM2.5 problem within Bangkok. Explaining that the problem is being exacerbated by nitrogen dioxide (NO2) being released into the atmosphere in such large amounts that it is undergoing a chemical reaction with the ozone layer and sunlight, thereby producing the problematic particulate matter. Nitrogen dioxide is a product of the internal combustion process within diesel engines, so many countries around the world that are extremely concerned with their citizens’ health are currently attempting to reduce the use of said engines. The hazards of particulate matter: The tiny size of said particles means that PM2.5 dust can easily be ingested into the respiratory system and lungs. Furthermore, some particles may be transferred into the bloodstream and circulate throughout the human body, with disastrous consequences. Dangers posed to the respiratory system and lungs: It is simple to see how air pollution can have a direct effect on the respiratory system and lungs. This is especially so with regard to tiny particulate matter, which cannot be seen with the naked eye, as its size means it can be ingested faster and more easily than larger matter, resulting in serious consequences for those with congenital asthma, or potentially even being a cause of asthma developing in others. If no appropriate prevention has been done, it could result in an accumulation of the dust over time, which is a major factor behind the eventual onset of lung cancer. Dangers posed to the cardiovascular system: Ingestion of particulate matter over a period of time can result in the secretion of sediment within the veins and arteries, potentially leading to a heart attack or an ischemic stroke. Additionally, exposure to air pollution can have a serious effect on cardiovascular muscle cells, which may lead to arrhythmia or even heart failure. Dangers posed to the brain: When particulate matter is small enough to pass into the bloodstream and build up over time, it can result in high blood pressure as well as thicker blood viscosity, both of which increase the risk of thrombosis in the brain. Additionally, the veins in the brain can become stiff, meaning the risks of an ischemic or hemorrhagic stroke are also increased, both of which can cause permanent disabilities, paralysis and even death. All those residing in the Greater Bangkok area are at risk if sufficient protection is not utilized, although the amount of risk depends on the individual’s health and strength. With regard to children, pregnant women, the elderly and those with congenital health disorders, especially lung or heart issues, these groups are viewed as being particularly at risk. Children: Generally speaking, the younger a person is, the greater the danger they are in. This is because young infants have immune systems which are not yet as strong as their adult counterparts, and their various bodily organs are still developing. Thus, airborne pollutants that are able to enter the respiratory and circulatory systems easily can inhibit the growth of the numerous bodily systems, or eventually lead to serious illness and disease. Pregnant women: In addition to risks posed to the mother from direct exposure to airborne pollutants, there are also dangers present for the unborn child. Studies have shown that air pollution can result in premature birth, a higher risk of a miscarriage and an increased danger of a fatality while still in the womb. The elderly: As we age, our bodies deteriorate, as do various bodily functions, resulting in a weakened immune system. Hence, when an elderly person is exposed to air pollution, they may be at risk of developing cardiovascular disease and asthma. This is especially pertinent for older people with a congenital health condition. Such people should take extra care to avoid exposure to airborne pollutants. Hospital patients or people suffering from congenital health disorders: People suffering from a respiratory disease, lung disease and various forms of cardiovascular disease are particularly at risk when exposed to high levels of air pollution, as it can have a direct effect on their condition, potentially resulting in a loss of life. Face masks: Protect yourself from PM2.5 pollutants with a mask that covers your nose and which is able to offer effective protection against the toxic particulate matter, such as N95 masks that offer at least 95% protection, and N99 masks that provide up to 99% protection. Such masks should be worn correctly, as recommended by the manufacturer. This means paying particular attention to a tight fit, in order to ensure the mask can effectively filter out the particles. Moreover, previously used masks that have a layer of dust on them should be thrown away rather than used again. Loading applications: Monitor the current air quality situation through the use of various applications, including Asia Air Quality (Android), Global Air Quality (Android) and Air Quality Index (iOS) apps. Avoid outdoor activities: Outdoor travel means greater exposure to air pollution and the potential for ingestion of large amounts of particulate matter. You should therefore try to avoid any non-essential journeys. This is particularly crucial for outdoor exercise enthusiasts who should cease partaking in any form of outdoor exercise during periods of smog and the presence of high particulate matter. Strenuous activity or heavy breathing can increase the levels of particulate matter ingested into the respiratory system and lungs. Try to stay at home or in buildings which are properly closed off from the outside air: You may want to use air conditioning devices – despite the outside temperature not being particularly high – or close all your windows and doors during periods of decreased air quality. In some cases, effective air purifying equipment may be utilized in order to filter out any particulate matter in the air supply. Stop smoking, as well as any other activities that produce smoke: Smoking or the ingestion of any form of smoke can result in a weakened respiratory system, meaning that when exposure to air pollution is added into the mix, it can have an even greater negative effect on overall health, increasing the risk of asthma and lung cancer. Pay close attention to your health: This is particularly important for those with congenital health conditions who should always keep their medication close by, or consult with their doctor in order to receive appropriate advice and recommendations. Protect yourself accordingly if you are unable to avoid areas with severely depleted air quality. If you are unsure of whether you are protecting yourself effectively, if you are categorized at being at high risk or experience any symptoms, such as difficulty breathing, feeling faint, exhaustion or a prolonged and serious cough, medical attention should be sought immediately to receive timely and proper treatment. Do not, under any circumstances, ignore the decreased air quality currently enveloping Greater Bangkok because, even though the particulate matter may be invisible to the naked eye, it is dangerous enough to pose a risk to your life. PM2.5 Air Pollutants: Tiny Particles That Can Have Huge (Health) Consequences The World Health Organization (WHO) has set an average rate for PM2.5 air pollutants, stating that if there are over 25 micrograms per cubic meter, it is seen as being dangerous to health. At the same time, Thailand has put the levels at which a danger is posed to health by PM2.5 air pollutants at 50 micrograms per cubic meter.